It’s beginning to look a lot like X-Mas. The X-Men celebrate the holidays, and their return to prominence, by dominating the top-tier of the Fantasy Comic League appearance estimates. Nine of the uncanny mutants represent December’s best bets, top among them are Iceman, Jean Grey, Nightcrawler and Storm. X-23 and Bishop follow close behind as the new flagship team begins to round itself out. Thanks to their role in the ongoing Uncanny X-Men series, the core quartet of the X-Men student body – Armor, Glob, Pixie and Rockslide – make their first appearances in the preview estimates. Uncanny is not the only book to feature a gathering of mutants. 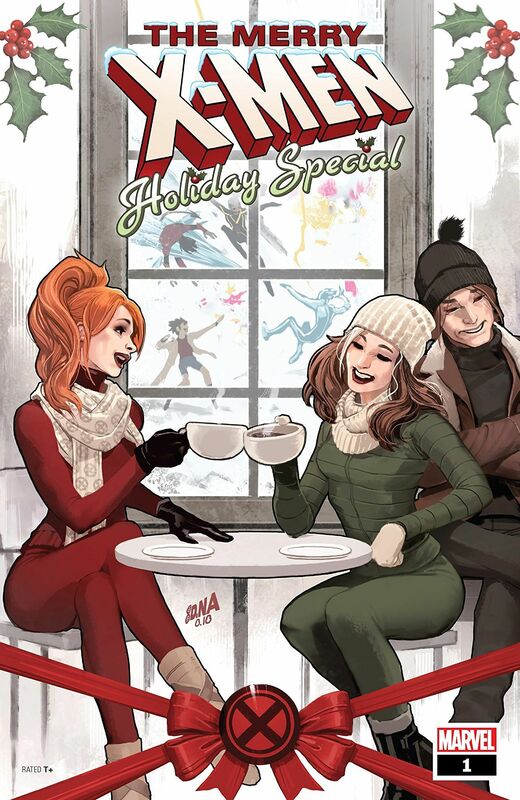 Kitty and her team star in the Merry X-Men Holiday Special as well as crash Mr. and Mrs. X’s housewarming party. X-Men: Extermination comes to a conclusion but only the Original 5 time-displaced X-Men get the benefit of an estimated appearance since the main X-Men have enough going for them already. Spider-Geddon also reaches its conclusion. Miles leads the pack of non-Parker based Spider-characters. His leading role in Geddon combined with the start of a new Miles Morales: Spider-Man book earns him a spot in the top-tier with his mentor. Otto Octavius also receives his own new Superior Spider-Man title. Spider-Force and Spider-Girls wrap up but if you have a taste for spiders, like the Inheritors, you may be better off sticking with the aforementioned Miles or Otto. More new series in store for the month star the Winter Soldier and a new, but old, X-Force team including Domino, Warpath and Cannonball. Other books of note include the Fantastic Four: Wedding Special, the Champions Annual which focuses on their newest teammate Snowguard and Season’s Beatings featuring a wacky team-up between Deadpool, the Spider-Men, Squirrel Girl and Gwenpool! The Hulk, Namor, Doctor Strange and Silver Surfer star in a four-part series which builds to Defenders: The Best Defense. A character defining moment is also teased in the Infinity Wars: Fallen Guardian, but which of the five space scoundrels will make the ultimate sacrifice? Dopplegangers of our main characters are found in Marvel Action: Spider-Man, Spider-Geddon Handbook, Marvel Action: Avengers, Marvel Super Hero Adventures: Captain Marvel – Frost Giants Among Us!, and Old Man Hawkeye (with the exception of Old Man Logan if he appears). Best of luck to all divisions of the Fantasy Comic League: #Asgard; #DoYouEvenComicBook; #Latveria; #Midtown; #Multiverse; #NegativeZone; #RedRoom; #Wakanda; and our newest divisions #AsteroidM and #Genosah. Please see the attached Power Summary file for further power clarifications. Please follow along with our #FantasyComicLeague tweets on our Twitter for official power scoring and discussions. Seasons run for four months, stay tuned for your chance to join the official league and win a trade paperback of your choice! These appearance estimates, based on comic solicitations and cover artwork provided by the Marvel Database wiki, are meant as a guideline and not an indication of a specific draft order. Character names, team designations and power sets conform to the most current information provided by the Database. Power designations are simplified for easier classification and choice, providing the majority of the heroes with up to 10 eligible powers from which to choose. As a reminder, you may only have one hero per team designation on your roster and are allowed to select three powers from the heroes’ power set. Powers in (parenthesis) are a subset of the overall ability and can be selected as well as the generic use of that power. For example, Deadpool can be drafted as any of his four team classifications and can use Weapons, Blades and Guns as his three powers (Blades and Guns being a subset of the overall Weapons skill).